Tell us about your entrepreneurial product or service. 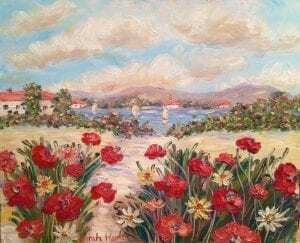 I paint original oil paintings of flowers, landscapes, Tuscany, French Country with bright, vivid colors and use a lot of impasto and texture. I began by selling on ebay and have been selling on the internet for over a decade. What inspired you to launch your business idea? I always painted as a kid but never dreamed I’d be an artist. I ditched those ideas to get a business degree in Marketing. Then, while my four children were still quite young and I was a stay at home mom, I began to get the itch to do something. My husband was also starting his business at this time. I began painting oil paintings like I had done as a child. They really started selling like hotcakes on the internet. What problem does your business or organization solve? Customers buy my art to decorate their home walls or corporate offices. People often tell me my pictures make them “happy”. There are not that many things in life that can do that, you know, like make someone feel happiness. What has been your biggest challenge as an entrepreneur and how are you working to overcome it? Time is a big challenge, since I have four children and they were all very young when I started. I also think believing in yourself is a huge challenge. I would never have kept going without all the compliments from my customers, friends and family! The feedback people give artists is amazing. It is a respect that I don’t think every seller selling a product gets. Ten years later, I am still selling and painting. The internet has become very fragmented though and I am trying to navigate my niche and reclaim my followers. Give us one word that people might use to describe you. Well my parents said it just the other night…. I am DETERMINED. I will not give up… EVER! How has Project Eve helped you and/or your business? Hoping it will! I just joined Give us an insider tip that relates to your industry or startup story. I always tell people that everyone is an artist, if they want it bad enough. Some people have the talent but they don’t want to do it. You have to want it and you have to practice. Mozart was part talent, but mostly he practiced like crazy. Practice like crazy…. you will get closer to genius! I also tell people to see things in the paint and let that guide you. I don’t paint from pictures, I paint from my mind. That way I can focus on color, texture, feeling. I don’t get caught up in mistakes or why something should be looking more perfect. That way I get the magic into the painting, that extra shapeliness or twinkle of light that would never have gotten there if I was trying to hard. Make your paintings stir a feeling in people. They will never forget that feeling. Company: Sarah Kadlic Gallery Impressionist Oil Painting Website: Follow my organization on social media here: [email protected] sarah kadlic impressionist art gallery pinterest: sarah kadlic just off the easel Please submit your story to the largest archive of entrepreneurial startup stories in the world so, together, we can motivate women in business to think beyond traditional boundaries, support one another, embrace change and view challenges as opportunities. Whether you are a small business owner, a freelancer, a serial entrepreneur, own an online business, operate a storefront on Main Street, or even moonlight with an amateur blog our 500,000+ community would like to hear your Startup Story! Answer seven short questions to create a blog of your story today!